We’ve had James Bond on the brain lately, for so many different reasons. Sony has been doling out teases for Skyfall, which brings Daniel Craig back into the fold in November. The Blu-ray box set, Bond 50, has unearthed 007 thrillers that laid dormant for decades, giving us the chance to reconnect with past members of her majesty’s secret service. 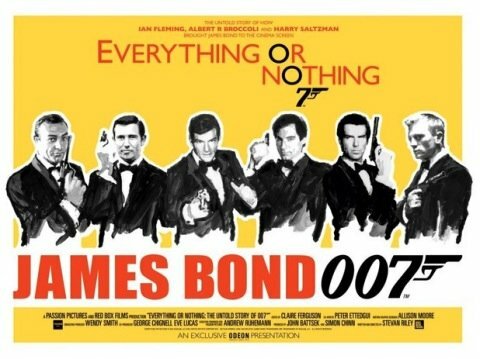 And now we’re getting a look at the forthcoming James Bond documentary Everything or Nothing, which will be in theaters in the UK beginning on Oct. 5, and available on EPIX in the States around the same time. The clip comes courtesy of Empire. We forget how much pressure comes along with stepping into the tuxedo of cinema’s most famous spy, so it’s enlightening to hear Pierce Brosnan reflect on the moment he first had to utter the signature introduction, “The name is Bond. James Bond.” And I love how he doesn’t play it cool in this clip. He lets the passion, the nerves, the concern and the delight shine through in his recollection. This was a very big deal for him at the time, and it feels like his movies spent in the role remain a very important deal. Hopefully the rest of the documentary will feature as many honest, candid moments of Bond confessionals as it explores the franchise’s 50-year history. Stevan Riley directs the documentary, which released this official poster a while back. Check your local listings for EPIX’s schedule, and be sure to support the various Bond endeavors which are making their way out into the world in the next few weeks and months. It’s a very good time to be a Bond fan.